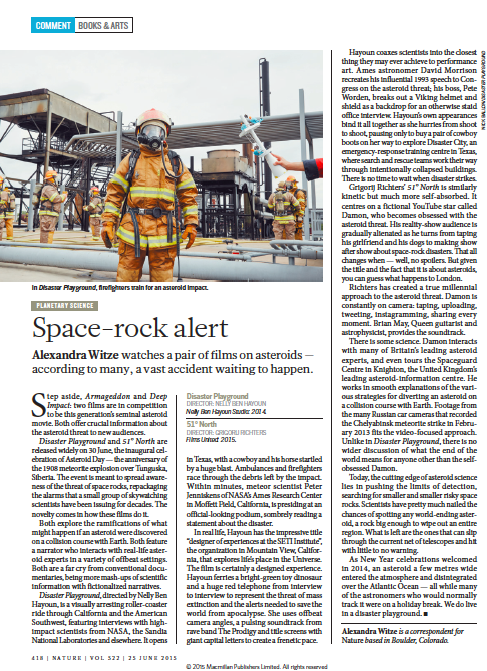 of the threat of space rocks, repackaging the alarms that a small group of skywatching scientists have been issuing for decades. The novelty comes in how these films do it. Both explore the ramifications of what might happen if an asteroid were discovered on a collision course with Earth. Both feature a narrator who interacts with real-life asteroid experts in a variety of offbeat settings. Both are a far cry from conventional documentaries, being more mash-ups of scientific information with fictionalized narratives. Southwest, featuring interviews with highimpact scientists from NASA, the Sandia National Laboratories and elsewhere. It opens in Texas, with a cowboy and his horse startled by a huge blast. Ambulances and firefighters race through the debris left by the impact. Within minutes, meteor scientist Peter Jenniskens of NASA’s Ames Research Center in Moffett Field, California, is presiding at an official-looking podium, sombrely reading a statement about the disaster. In real life, Hayoun has the impressive title “designer of experiences at the SETI Institute”, the organization in Mountain View, California, that explores life’s place in the Universe. The film is certainly a designed experience. where search and rescue teams work their way through intentionally collapsed buildings. There is no time to wait when disaster strikes. Today, the cutting edge of asteroid science lies in pushing the limits of detection, searching for smaller and smaller risky space rocks. Scientists have pretty much nailed the chances of spotting any world-ending asteroid, a rock big enough to wipe out an entire region. What is left are the ones that can slip through the current net of telescopes and hit with little to no warning. As New Year celebrations welcomed in 2014, an asteroid a few metres wide entered the atmosphere and disintegrated over the Atlantic Ocean — all while many of the astronomers who would normally track it were on a holiday break. We do live in a disaster playground. Alexandra Witze is a correspondent for Nature based in Boulder, Colorado. Nelly Ben Hayoun Studio: 2014.